I was feeling nostalgic so went looking for a fairy tale to read. Why not one about a 12 year old evil genius looking to steal the pot of gold? 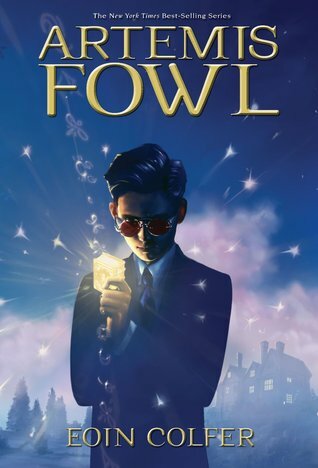 Also Artemis Fowl is about to get a silver screen treatment. I have always had very mixed feelings towards fairy tale retelling. I understand fairy tales were meant to be passed along and that will include its own bit of telephone with each iteration. However. The amount of modern retelling that abuse classics to the point I can't even find the original backbone is exhausting. Artemis Fowl is able to take the fairies of old and insert them into the modern world because this is inspired by fairy tales as a whole without trying to retell any specific story. Artemis Fowl plans on putting his white collar crime family back on top by robbing the pot of gold at the end of the rainbow. He is assisted by an intense mercenary trained from birth to complete any challenge, Butler. He is hampered by a loony tunes mother. He is definitely operating above his age group. But can he really outsmart the fairies, who have protected their gold from humans for millennia? This is a completely enjoyable quick read that I really hope they don't screw up in Hollywood. It is action packed without being overly serious and grim. An excellent variety of fairies are represented. I'm going to need to see if my library has the rest of the series.